August is always a difficult time for The Long Halloween. There aren't really any major holidays to be found at all. Calendars always just have the PGA Championships just to have something to fill those blank dates. So what does that mean for this column? We've been cruising through the greatest Simpsons holiday specials all year. Do we focus on golf with "Dead Putting Society" (S2;E6), "Scenes from the Class Struggle in Springfield" (S7;E14), and even shout-out to Lee Carvallo's Putting Challenge in "Marge Be Not Proud" (S7;E11)? Something about that is still a little unsatisfying. Naturally, we took inspiration from the Long Halloween's namesake, the 1996 Batman comic by Jeph Loeb and Tim Sale. They were also a bit stumped by August, but since Loeb's father's birthday is in that month, they also made it the birthday of crime boss Carmine "The Roman" Falcone and centered their holiday-themed issue that month around that event. This is a roundabout way to say that my birthday is also in August - so of course, it's then time to talk about Birthdays on The Simpsons. As you do. There is an expert list of every birthday from the show that you can find over here. Typically characters seem to forget each other's birthdays, whether it be Homer forgetting Marge's in "Life on the Fast Lane" (S1;E9) or Bart forgetting Lisa's in "Stark Raving Dad" (S3;E1). The latter is particularly notable for featuring one of the show's all-time biggest guest stars, Michael Jackson. 1991 Michael is interesting, considering he was still the biggest star on the planet without the tainted legacy of erratic behavior, bizarro health problems, and child molestation charges. While it's obvious that Michael was probably more of a victim himself of brutal parenting and an inability to really deal with fame, there is still a bit of a taint to parts of this episode, particularly how excited Bart is to have MJ stay over at his house. When thinking of Simpsons birthdays it's tough to get "Lisa, It's Your Birthday" out of your head, but really "Stark Raving Dad" is a swirl of riffing on One Flew Over the Cuckoo's Nest (1975), Michael Jackson's oeuvre, and only ties that birthday on during its final, sweet moments. We can look beyond to shoddy thoughtless last minute birthday gifts (both from Bart) in "New Kid on the Block" (S4;E8) and "Sunday, Cruddy Sunday" (S10;E11). There is also the notable moment in "The Springfield Files" when Homer notes that his birthday is the same as the dog's (S8;E11). There are, however, three notable Birthday Party episodes that you could watch in August. If it's your birthday. Like mine and Jeph Loeb's father. The first is the first birthday of Maggie Simpson in "Lady Bouvier's Lover" (S5;E21). There's nothing really exceptional about the party, but the episode should be known for two fantastic moments, the first when Homer pictures how his kids would look if they were more realistic (derived from his own insane logic, which stems that if his father dated Marge's mother, they would become siblings). The second is "The Sound of Grandpa" which parodies Simon & Garfunkel along with the ending of The Graduate (1967), and remains one of the show's better, subtle parody songs. The only song that may come close is the biting truth of "Flaming Moe's", tackling the same subject of Cheers' "Where Everybody Knows Your Name" with an acerbic Simpsons twist. Both songs were crooned by Kipp Lennon, who also provided Michael Jackson's singing voice in "Stark Raving Dad." There's your Simpsons trivia for the day. "You know - makin' babies!" Moving on, we have Martin Prince's extensive birthday celebration in "Grade School Confidential" (S8;E19). There are some great moments that capture the overall shittiness of children's' birthday parties, from the massive boredom adults may feel, to the awkwardness of interacting with both people you don't know or people in a new setting. It's enough to make you sick - literally if you got into that bad batch of oysters. This episode also features one of the better subtle moments in the series - as the camera pans over the crowd after they learn that Skinner is a virgin, Krusty's face goes from sheer horror to unbridled joy. It's a magnificent background touch. 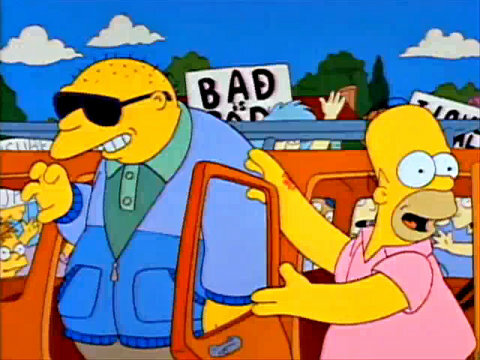 Finally, perhaps the most famous Simpsons birthday episode is "Rosebud" (S5;E4), which features a birthday not from the core family, but C. Montgomery Burns. It also gave us a birthday song that we should be singing more often than "Lisa, It's Your Birthday." More importantly though, "Rosebud" illustrates that all the riches and fancy gifts and guests int he world can't buy us what we really want - whether it's just family, friendships, or a small stuffed bear named Bobo that symbolizes our childhood innocence. We only have one more month full of holidays until we come full circle and that will be about it. 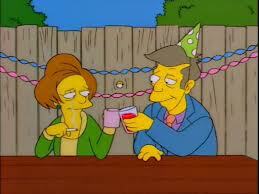 Stay tuned for one more great September Simpsons episode to enjoy - until then, Happy Birthday! Summer Jam Week 15: GaGa vs. Katy Again! Summer Jam Week 13: Blurred or Clarity?